MesoDerm Cream [3.5 oz] Indications: Excess fat on Chin, Jowls, Abdomen, Thighs, Hips, Arms, Buttocks, Neck Hump, Lipomas, Love Handles, Cellulite, Muffin top Ingredients: Each pump delivers 60 mg of phosphatidycholine, hyaluronic acid, and deoxycholic acid in a proprietary blend. 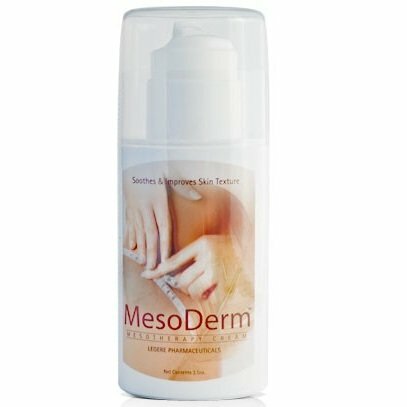 MesoDermâ" , is a topical cream designed to help dissolve fat, soothe the skin and improve skin texture. Each full press pump delivers 60 mg. of bio-identical compounds proven to assist in lipid metabolism and fat dissolution MesoDermTM is formulated to provide maximum absorption through the skin. Key ingredients (Deoxycholic acid and Phosphatidyl choline) are bio-identical compounds similar to what the body produces. These lipid soluble compounds are essential to the systematic process of action. The small size of their molecules allow for these compounds to easily pass between the cells. Both Deoxycholic acid and Phosphatidyl choline are unique carriers for nutrient transport throughout internal membranes. Deoxycholic Acid: Assists in the breakdown of fat for efficient secretion and conversion from Cholic acid. Facilitates fat emulsification from food and assists in the distribution of energy. Hyaluronic Acid: Component of connective tissue whose function is to cushion, lubricate and plump. Phosphatidyl Choline: Vital for optimum liver function, assisting in the elimination of fatty deposits (detoxify). Allantoin:Healing, moisturizing, soothing and anti-irritating, keratolytic and non-toxic. Commonly used in dermatological applications. Vitamins A, C, and E are included in the formula and provide powerful anti-oxidant protection. Shea butter provides ultra-moisturizing benefits. PLEASE NOTE: if you are not going to workout and follow a sensible eating plan - you will waste your money. Product works when combined with diet and exercise.